77 pages! DYNAMITE ENTERTAINMENT is proud to be the new home for the next series of Garth Ennis war books, all under the Battlefields header! Late summer, 1942. As the German army smashes deep into Soviet Russia and the defenders of the Motherland retreat in disarray, a new bomber squadron arrives at a Russian forward airbase. Its crews will fly flimsy wooden biplanes on lethal night missions over German lines, risking fiery death as they fling themselves against the invader- but for these pilots, the consequences of capture will be even worse. For the pilots of the 599th Night Bomber Regiment are women. In the deadly skies of the Eastern front, they will become a legend- known, to friend and foe alike, as the Night Witches. 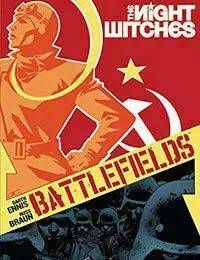 Featuring issues 1-3 of the Night Witches series!